OTS provides guest wireless access to IIT tenants, IIT supported events, and visitors of the University who are sponsored by faculty, staff, or student of Illinois Institute of Technology. Visitors can self-resgister on the network by following the process below. For large events the person sponsoring can request access for the visitors by contacting the OTS Support Desk. IIT-Connect provides internet access to guests and tenants of Illinois Institute of Technology. Login credentials or an access code is required to gain internet connectivity. Once connected, a login page should automatically load on most devices. Laptops and desktops may need to open a web browser to load the page. Enter the username and passwored provided, read the terms and conditions, and click the checkbox if you agree. If you do not have login credentials, please follow the steps below to self-register. Click “REGISTER FOR ACCESS HERE”. Enter your login information, accept the terms and conditions, and click “Get Connected”. 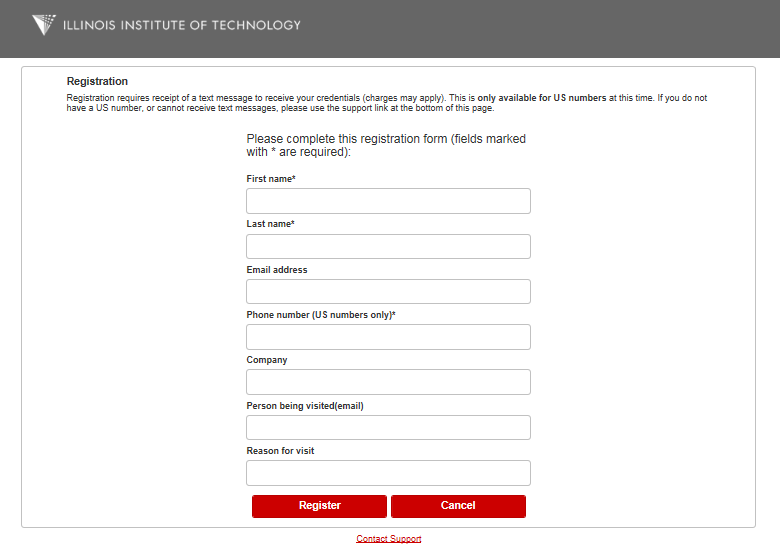 Upon successful login you will be redirected to the main iit.edu website. If you are unable to login, or have any further issues obtaining guest access please contact the OTS Support Desk. All event requests are routed through IIT Event Services. If you have network specific needs for your event, such as wireless access for your non IIT guests, or wired connectivity at a specific location, that information should be submitted to event services. Event Services can be contacted by your preferred method below.